BEDFORD, Mass., Aug. 16, 2018 — VoltDB, the enterprise-class database that powers real-time intelligent decisions on streaming data, today announced new platform updates to support fast data strategies as telcos and other industries prepare for the transition to 5G. With the immense increase in throughput and data volume that 5G is promising, the need for real-time data analytics is essential for organizations to capitalize on 5G networks when it comes to the Internet of Things (IoT), artificial intelligence (AI), network slicing and more. 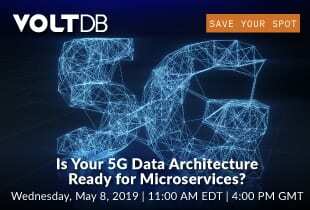 VoltDB is the only existing technology that can support the scale and speed 5G promises, surpassing current NoSQL technologies such as Redis.